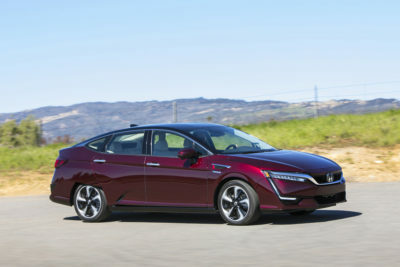 Honda’s Clarity family of fuel-saving midsize sedans offers two models, the Clarity Fuel Cell and Clarity Electric, that offer radically different views of what fully electric driving should be. Both provide loads of luxury appointments, comfort and decent family sedan handling and performance. But while one can go more than 300 miles between fill-ups, the other offers just 89 miles of range. Most Americans will never see either of them. The long distance version, the Clarity Fuel Cell, is available only in a few select California locales. Just a half-dozen Southern California dealerships, five in the San Francisco Bay area and one in the state capital of Sacramento are authorized the lease the car to consumers. You could of course ship a Honda car to your location, but that’s not an option for everyone. The Clarity Electric is available only in California and Oregon. While more readily available than the Fuel Cell, it can’t be had everywhere in either state – only about 60 Honda dealers in California and four in Oregon are handling it. And yes, a fuel-cell car is an electric car. It just makes its own juice from hydrogen rather than drawing it from the grid via a charging cord. More about that a bit later. For the consumer, the biggest downside to a hydrogen car is availability and price of the fuel it needs. The rare few who drive Honda’s fuel cell car on a regular basis don’t have to worry much about hydrogen’s pump price, though, because Honda includes a tanker-load of fuel in the lease. 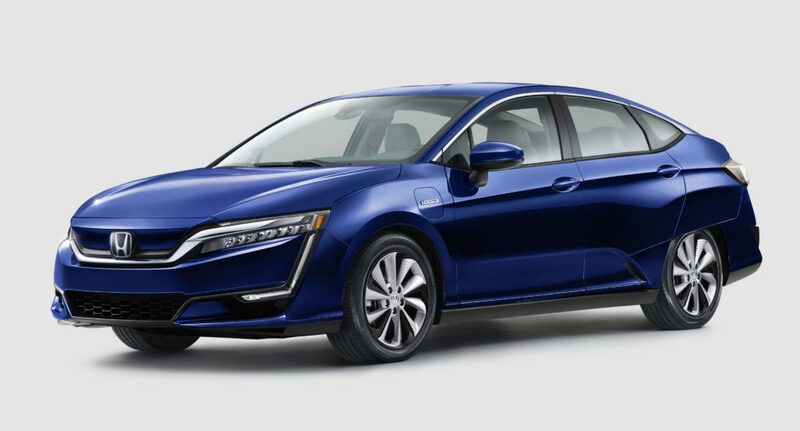 But you can imagine how high my eyebrows lifted as I recently pulled up to the pump in a Honda Clarity Fuel Cell sedan and saw the posted retail price of $16.19 per gallon-equivalent for the compressed hydrogen gas it needs to keep going. Even by California standards – and regular gas in my home state is averaging $3.51 a gallon these days, almost a buck a gallon higher than the national average – hydrogen fuel at retail is no bargain. Even the Clarity Fuel Cell’s EPA rating of 69 miles per gallon-equivalent can’t underpin much of an economic argument. That’s why Honda’s all-encompassing $369 monthly lease fee includes up to $15,000 worth over the three-year, 60,000-miles life of the lease, along with regular maintenance, up to 21 days of luxury car rental for trips into territory where hydrogen stations don’t exist, and insurance to cover the pricey fuel-cell system components. Clarity Fuel Cell lessees also don’t have to worry much about availability: You have to apply to lease one of the cars and they are only available in areas of urban Southern and Northern California where almost all of the nation’s retail hydrogen stations are located. Electricity from the grid is a lot cheaper than electricity produced in a fuel-cell, so the Honda Clarity Electric, a battery-EV version of the same midsize, five-passenger sedan, is a lot cheaper to run. Figure just under $2.40 for a full charge (about a third of a penny per mile) at the national average retail price for electricity of 10.5-cents a kilowatt-hour. It is also lot cheaper to lease. But there’s a reason, and it isn’t a particularly good one. While the Clarity Fuel Cell is EPA rated at up to 366 miles of range, the Clarity Electric is rated at a mere 89 miles on a full charge. That’s woefully below what most other EV makers are aiming for these days – 150 miles seems to be the bare minimum that most customers seek. To be fair, 89 miles is more than most of us will drive on a normal day. But it’s still tough to justify a new car if all we can use it for is the daily commute and/or running the kids around town and local shopping. To make up for the lack of range, Honda is offering a pretty inexpensive 36-month lease of just $199 a month, for up to 20,000 miles a year, in those areas of California and Oregon where it is available. The car I topped off with hydrogen was a 2017 Honda Clarity Fuel Cell. 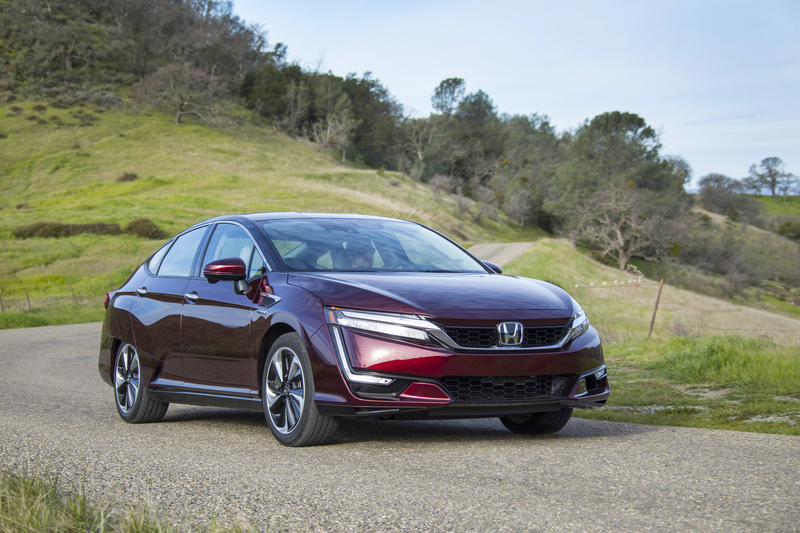 The identical 2018 model begins arriving this month at all 12 of the California stores that are the only Honda dealerships in the nation authorized to lease and service the hydrogen-electric sedan. Honda has leased fewer than 1,000 of the sedans since the car was introduced as a 2017 model. That’s in large part because of the limited sales territory, but there’s also an issue of familiarity. Hydrogen fuel-cell based electric propulsion systems are little understood, so many people who hear about them are wary. 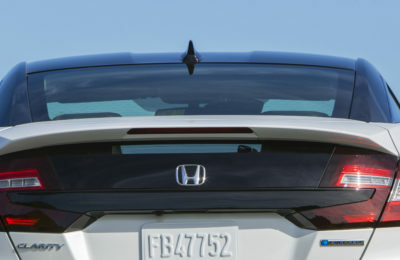 The reason the battery-dependent Clarity Electric also is a limited-edition model seems to be that Honda sees no real market demand for it and is using it simply as a compliance car to score some of the zero-emission vehicle credits it needs to satisfy California air quality regulators. A new member of the family, the Clarity Plug In Hybrid, or PHEV, is marketed in all 50 states and ought to appeal a lot more than the battery EV model. It offers a lot of all-electric range, 47 miles, plus a decent 42 mpg combined city-highway rating when operating in standard hybrid mode. That’s when its 1.5-liter gas engine is working in tandem with the electric motor. The EPA rates the Clarity PHEV’s range on a fully charged battery and a tank of gas at 340 miles. A separate review of the Clarity PHEV is coming soon. The Clarity Fuel Cell is rated at 366 miles per hydrogen fill-up, equivalent of 69 miles per gallon. Mileage, of course, depends on lots of things. I do a lot of freeway driving at speeds in excess of 60 mph and averaged 54 mpg-equivalent on the 160 miles I put on the Clarity Fuel Cell that Honda loaned TheGreenCarGuy.com. Honda, along with Toyota, has leadership that’s convinced the hydrogen fuel-cell electric car will be the best bet for a clean propulsion automotive future. Honda makes other “green” models with other powertrains and fuels, though, because one can never be absolutely certain. But the company believes that fuel-cell electric systems provide a benefit that battery-dependent systems can’t yet and may never provide: Long range and refueling convenience that is close to that of the internal combustion models with which we are all familiar. Fuel-cell systems also are more compact than battery-electric systems, and can be more readily scaled up and down than can bulky battery-based electric powertrains. Honda’s planners believe those factors, along with the relative ease with which hydrogen fuel can be made, makes FCEVs, or fuel-cell electric vehicles – cars, SUVs, crossovers and trucks – more logical for markets like the U.S. That would be markets in which most consumers believe they need unlimited range even if they rarely drive more than a few dozen miles from home. Honda and Toyota are the biggest companies banging loudest on the hydrogen fuel cell drum, but they aren’t alone. Hyundai builds a fuel-cell crossover. It was in fact the first car company to hit the retail market in the U.S. with a fuel cell vehicle, the Tucson FCEV, and is replacing that later this year with a new fuel-cell crossover, the Hyundai Nexeo. Several other major companies including Mercedes-Benz, Audi and General Motors have or have had fuel-cell test vehicle programs underway. A scant three years from now there could be a dozen or more automotive brands – including Toyota, Mercedes-Benz, Lexus, Kia, Honda and BMW – marketing fuel cell vehicles, according to a recent global analysis of fuel cell vehicle trends by market research firm Information Trends. 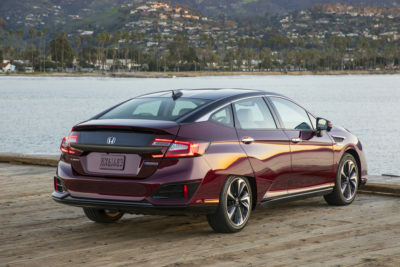 The Honda Clarity Fuel Cell qualifies for California’s $5,000 cash rebate for fuel cell vehicles. The feds killed the federal income tax credit for fuel cell cars at the end of 2017. The Clarity Electric qualifies for the full federal income tax credit for electric vehicles, or up to $7,500, as well as for $2,500 rebates in California and Oregon (more if lessees qualify under the states’ low- and moderate-income standards). State rebates go directly to the consumer, but federal tax credits can only be claimed by a vehicle’s registered owner, and in the case of both leased models that’s the manufacturer’s leasing arm, not the consumer. Honda has said, though, that it has adjusted lease terms to give Clarity Fuel Cell and Electric customers benefit of the tax credit. Acceleration is okay but nothing to write home about: as with most electric drive cars the Clarity is quick on takeoff. But power drops off at higher speeds for both the Fuel Cell and Electric models. They’ll pass safely, but leave yourself a lot of room. The positioning of the Fuel Cell’s power system – under the hood, where a conventional car ‘s engine would be – means the Clarity FCEV isn’t pinned to the road the way a battery-electric would be. There’s a bit of body roll when cornering quickly, but not enough to be off-putting. Suspension is a bit soft, though, and it struggles to keep the car from bouncing its passengers a bit on really rough stretches of road. The Clarity Electric does a bit better on rough roads, thanks to the beneath-the-floor positioning of the heavy battery pack. Handling for both models is composed, not sporty, and steering is responsive but not terribly quick. 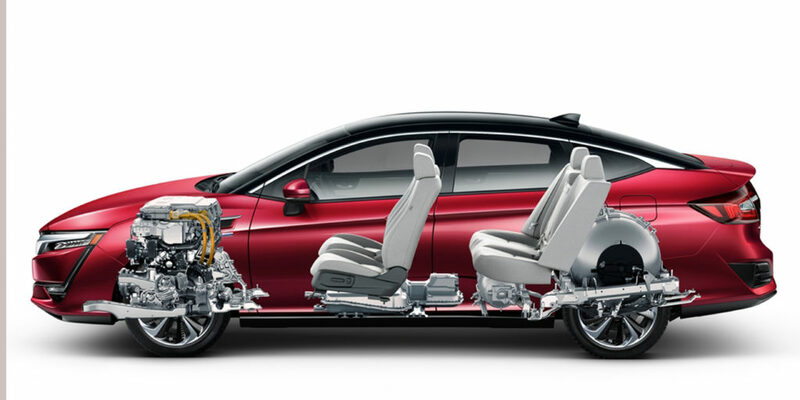 The Honda Clarity Fuel Cell is EPA rated at 366 miles of range from a full-load of 5.46 kilograms of hydrogen. Hydrogen is sold by the kilogram and one kg (2.2 lbs) contains the energy equivalent of a gallon of gas. The miles-per-gallon equivalency is 69 in the city, 67 on the highway and 68 combined. The Clarity Electric uses a 22.5 kilowatt-hour lithium-ion battery pack and is EPA rated at the equivalent of 126 mpg in the city, 103 mpg on the highway and 114 combined. The Electric consumes an average of 30 kwh of electricity for each 100 miles, thus its limited range of 89 miles per charge. In both fuel cell and battery versions, the Clarity offers plenty of room inside for four and can fit five adults comfortably for short trips. The seats – power adjustable up front – are well-padded but lateral support could be a bit better. Head room is impressive up front, but gets a little tight for taller passengers in the back as the roofline slopes down. The instrument layout is driver-oriented, a good thing, and the switchgear is easy to use. The touchscreen seemed a little slow to respond, though, and the layout of the console-mounted, push-button gear selector initially felt a bit awkward, but took only a few minutes to get used to (there is only one forward gear, so the choices are drive, reverse, neutral and park). Visibility is good, although the split rear-view takes some getting used to (there’s a narrow glass panel separating the cabin from the trunk and you look through that and the portion of the rear window that’s below the deck lid to see the lower part of the view behind you). Wind noise, which can be a problem in electric cars because there’s no engine rumble to mask things, is almost nonexistent, but with the audio off there is a bit of road noise that seems unusual until you realize that it’s always there but overpowered by engine and transmission sounds in cars with gas or diesel engines. The interior borders on luxury-car quality, with leather upholstery, a soft touch dash covering that’s almost like suede, and a clean, contemporary instrument panel and dash layout. The wood trim is plastic, but it looks pretty realistic. The trunk loses some room to a piece of the rearmost hydrogen tank in the Fuel Cell and to batteries in the Electric. But it is still fairly roomy although the floor is far from flat. 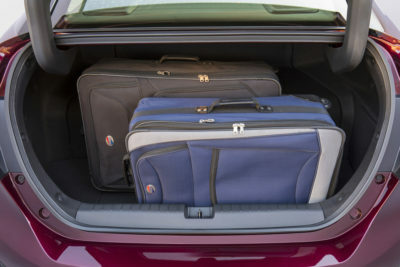 A pair of carry-on bags, a week’s worth of groceries or a couple sets of golf clubs will fit in the deepest portion of the Clarity Fuel Cell’s 11.8 cubic feet of trunk. The Clarity Electric’s batteries don’t intrude as much as the Fuel Cells tanks, so it offers 20 percent more trunk space. Both the Clarity Fuel Cell and Clarity Electric come loaded with driver assist technology (the backbone of self-driving capability in future models) including adaptive cruise control, lane keeping assist, forward collision mitigation, stability and traction control and blind spot monitoring via the Honda LaneWatch system that displays a view of the passenger-side roadway on the navigation screen. 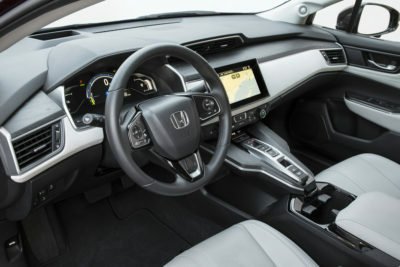 Honda also provides voice control for the infotainment system (phone, navigation and audio) or you can skip that and simply use your smartphone’s voice system – presuming you pair it first. The Clarity Fuel Cell comes standard with an adjustable Head Up Display that projects speed, lane lines, following distance and even turn-by-turn navigation directions on the windshield ahead of the driver. Both models have Honda’s “acoustic vehicle alerting system,” an audible warning that sounds when idling or running at low speeds in order to alert pedestrians to the nearly silent cars’ presence. The Clarity Electric comes with an eight-speaker, 180-watt audio system with an 8-inch touchscreen display. The Clarity Fuel Cell ups the ante with a 540-watt, 12-speaker system, also with 8-inch touchscreen. Both offer Bluetooth connectivity, voice recognition, satellite-based navigation and Sirius satellite radio and Apple CarPlay and Android Auto capability. With a few differentiating tweaks, all versions of the Honda Clarity share the same exterior. It is one that looks to have been inspired by the Transformers and Imperial cruisers the current generation of auto designers grew up with. Lots of vents and scoops and creased metal surfaces. The spokes in the standard 18-inch alloy wheels (a different design for each model) look like saw-toothed turbine blades. The rear wheels are half-covered by the Clarity’s sheet metal. That’s to improve aerodynamics, but the look is less than pleasing. While I liked most of the views from most angles most of the time, I found the overall look a bit fussy and the rear to be too bulky, as though designed for a slightly larger car. It makes it easier to fit in the Fuel Cell model’s large, heavily insulated and armored hydrogen fuel tanks (one under the rear seat, one behind the seat and intruding into the truck space), but throws off the balance. It’s certainly no Pontiac Aztek of a design disaster, but it does take some getting used to. In all, “polarizing’ is probably the best way to put it. We offer elsewhere – for those interested – a deep dive into how fuel cell vehicles work, so we’ll go easy on you here. Basically, a hydrogen fuel-cell system uses a heat-and- chemical process to extract the electrons from hydrogen gas, then converts them to electrical current to power the vehicle’s electric motor. Excess electricity is stored in a lithium-ion battery pack until needed, usually when demand for a burst of power – for accelerating or climbing a steep grade, for instance – exceeds the fuel-cell stack’s output. Hydrogen tanks for Clarity Fuel Cell are under and behind rear seat, battery is beneath front seats and everything else is under the hood. Most everything after the fuel-cell stack is closely related, if not identical, to the powertrain components used on a battery electric vehicles. The big difference is the way the electricity gets on board. Battery EVs get power from a charging station connected to the power grid (or to a solar or other renewable electrical supply) and store it in a bulky, heavy and expensive battery pack than can take hours to refill. FCEVS make electricity from compressed hydrogen gas and can be refilled in a matter of a few minutes. But there’s no cost savings over battery-electrics as fuel cell systems are expensive. When all the components are added up, FCEVs at this stage of the game are more expensive than battery EVs. The Clarity Fuel Cell delivers a peak 174 horsepower and 221 lb-ft of torque. The Clarity Electric uses a 22.5 kilowatt-hour battery pack to push electricity to its front-mounted motor. At peak, the system pumps out 161 horsepower and 221 lb-ft of torque. Honda says it can be charged in just over 3 hours on a properly sized, 240-volt Level 2 home charging station, 19 hours on 120-volt household current. There are loads of reasons why electrified vehicles are the future, and lots of arguments for why they aren’t perfect. For those interested in the benefits – clean, quiet, emissions-free transportation that’s fun to drive and loaded with luxury goodies for relatively reasonable lease prices – both the Clarity Fuel Cell and the Clarity Electric are good deals. The Clarity Electric, however, offers laughable range for a five-seat family car. Its size and features could be a compelling argument for some. But for the range-nervous there are better choices including the Chevrolet Bolt and new Nissan Leaf EVs as well as the 2018 Clarity PHEV. The Clarity Fuel Cell offers all the amenities of the battery-dependent Electric, plus more than 300 miles of range and, for those who live in the right places and can actually qualify for a lease, fairly easy access to fueling stations. View through glass panel beneath Clarity’s deck lid is enabled by a narrow window in the cabin between the rear seat headrests. Next: Read our Honda Clarity Plug In Hybrid first-drive review.